Now an ART Hub and a CC Recognised Ringing Centre. What do YOU want to achieve in your bell ringing? The REC is dedicated to helping you get there. Our job is to enable you to acquire and improve those skills. You can ask our experienced teachers to create a learning plan for you, perhaps enrolling you in the Association of Ringing Teachers’ Learning the Ropes scheme. You can book as many sessions as you like with an experienced bell handling instructor. You can use our computers to try out one of several packages available. Are there theoretical points that have always puzzled you? We have the time to go through them with you. You can take a guided tour of the tower (access via a spiral staircase), examine the bells close up and safely watch a bell as it turns through 360˚ right next to you! You can request a course on almost any bell ringing topic and we will do our best to arrange it – or find out who can. Or a course that is already offered at the REC may suit you. Use a bell ringing computer program? You can sit at one of our computers and use Abel, Beltower or VirtualBelfry. Ring a quarter peal on the simulator? You are welcome to bring your band. We have a simulator on all 6 bells. Introduce non-ringers to bell ringing? 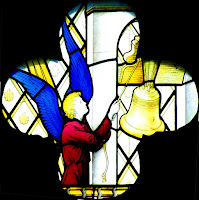 You can bring a group of work colleagues or friends for a tour of the bells and an introduction to change ringing. You are welcome to use the REC to teach people from your own tower at any level. 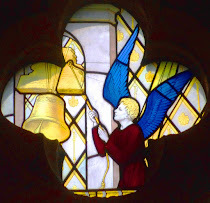 Angel bell-ringers at St James. Two of the angels in the South transept window. St James’ Church, Stretham, Ely, Cambs, CB6 3LD.